Acne is a common condition affecting individuals in their teenage years and into their twenties, thirties or beyond. Among adults, women are especially prone to acne. Although many younger patients “outgrow” their acne, most patients are afflicted with this condition for many years. The primary goal of treating acne is to prevent scarring, especially on the face. Acne scarring can be severe and is difficult to treat; most patients with significant acne scars have some degree of permanent disfigurement. For years antibiotics and Accutane have been the mainstay of treatment for moderate-to-severe acne. LaserClear is the first drug-free and highly effective treatment for serious acne. Moderate to severe acne requires systemic (oral) medication. The most common systemic treatment for acne is oral antibiotics, which are usually at least somewhat effective but must be taken for a prolonged period, usually for years. Antibiotics do not provide a cure for acne, but simply suppress the inflammation in the skin that causes visible acne; they do not treat the actual cause of the disease. Because antibiotics do not cure acne, they must be taken until the patient “grows out” of the acne, a period that can vary from a few to many years. It is impossible to predict how long antibiotics must be taken. Side effects of antibiotics taken for acne are common and can include stomach upset, sensitivity to sunlight, discoloration of teeth and skin (often permanent), and allergic reactions. Many people are concerned about the possible adverse effects of taking systemic antibiotics on a long-term basis. Bacteria that are normally present in the body become resistant to the antibiotics; this drug resistance can limit the effectiveness of these drugs if the patient gets an infection. There is also concern about the balance of species of micro-organisms in the gastrointestinal tract, an internal ecosystem called the microbiome that is increasingly being found to play a major role in many aspects of overall health. Up until now, the only treatment that can cure acne (cause a permanent remission) is oral Accutane. Accutane is a powerful drug related to vitamin A that must be taken for several months and that has several side effects, some serious. Accutane use is tightly regulated by the FDA mainly because this drug has a major risk of causing birth defects. Patients who take Accutane must have blood tests on a monthly basis to monitor for side effects on the liver and on serum triglyceride levels. Female patients must be on a highly effective form of birth control. Accutane use may also be associated with psychiatric conditions including depression. Accutane is not always effective and the treatment course may have to be repeated two or three times. LaserClear is the most exciting news in the field of acne treatment in many years. Clinical trials of this new laser alternative to treat moderate to severe acne have yielded a very high success rate in producing long term (two or more years) improvement. In all patients in these trials no medication of any kind (even topically applied) was necessary. LaserClear uses two separate lasers to deliver gentle energy to the skin with only minor discomfort; no anesthesia is needed. The laser treatments are given one after the other; each treatment takes only 20 to 30 minutes. After a series of treatments spaced two to four weeks apart, up to 80% of patients can expect long-term improvement of their acne. LaserClear is safe for all ages. 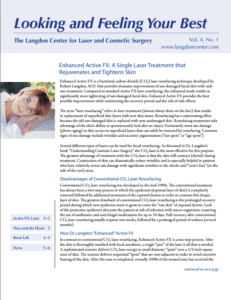 The Langdon Center is one of only a few comprehensive laser centers that have both types of laser needed for LaserClear treatment. Both of these lasers have been used for many years by Dr. Langdon and his associates for treating a variety of skin problems including facial age spots and hemangiomas. 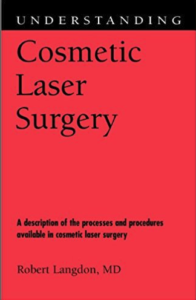 To learn more about the Laser Clear Treatment or to schedule your consultation with Board-Certified Cosmetic Surgeon Dr. Langdon, please fill out the form on this page or call The Langdon Center at (203) 442-9219. We look forward to working with you! The Langdon Center serves patients in the Guilford & New Haven, CT areas.